Reduce household fragrances. Keep your house fresh and clean without using air fresheners. Give your carpets and rugs a cleaning but remember to clean or change the vacuum filter first for maximum freshness. Open the windows. Put a bouquet of roses on the table. If your home smells stale, put a few drops of essential oils on cotton balls and leave them around the house. Throw out the dryer sheets. Use homemade dryer sheets. Combine ½ cup vinegar with 6-8 drops of grapefruit, orange, lemon or tea tree essential oils. Spritz this solution on an old washcloth until moist and throw it in your dryer with your clothes. 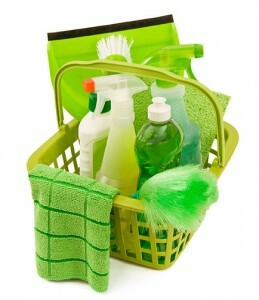 Use green cleaning products. You can clean most things with vinegar, baking soda, pure soap and a little determination. Avoid perfumes. Use essential oils or, better yet, use no scent at all. Buy natural cosmetics. Many cosmetics contain chemicals that may be endocrine disruptors but figuring out which ones are safe can be tricky. There are many cosmetic ingredients and sources disagree about their hazards. As a general rule, European standards are stricter than in the US so look for European brands. In addition to changing your cosmetics, you can reduce your exposure to endocrine disruptors by using cosmetics less often. Use natural shampoos and conditioners. Use vinegar or baking soda solutions to clean your hair. Store your food in glass. Phthalates make plastics soft and are found in sandwich bags and other pliable plastics. Fats absorb phthalates more easily than water, so be especially careful to store fatty foods in glass. Avoid heating or freezing food in plastic because extreme temperatures release the phthalates. Endocrine disruptors have some serious health risks, but luckily some relatively simple product substitutions reduce your exposure to these chemicals. For advice setting up your top 3 priorities to reduce endocrine disruptors in your life, give me a ring. I’ll help you make your list. And if you’re worried that you’ve had a high exposure to them, call me to make a plan to detox. There’s no reason your shower curtain needs to be a health risk. This article was posted in Wellness and tagged acupuncture, acupuncturist, contact, endocrine disruptors, Oregon, phthalates, salem. Bookmark the permalink. Follow comments with the RSS feed for this post. Both comments and trackbacks are closed.